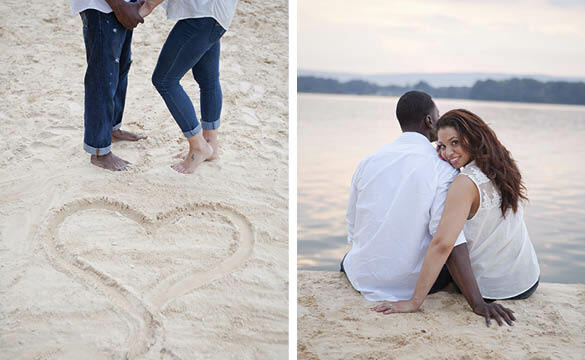 Takira and Sidney are *saving the date* for this May and we're super excited to share their engagement photos and Save the Date Magnet with you today. This classy couple cleans up well but they also know how to play and have fun too! 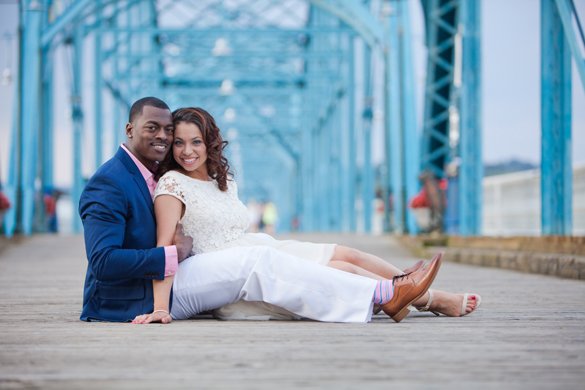 For their engagement photos, Takira and Sidney along with photographer, Daisy Moffatt, went to several locations in Chattanooga, TN. The first was staged in the Bluff View District. Takira said, "Bluff View has an old romantic feel that we thought mimicked the French alleys of Paris." 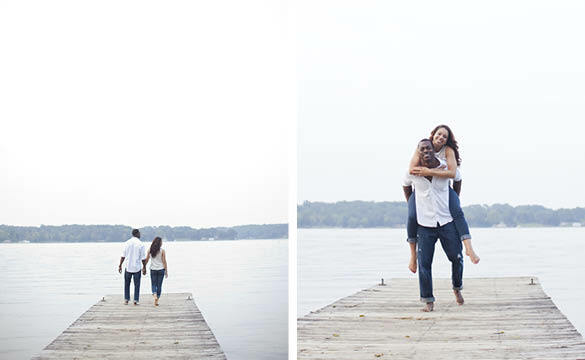 Enjoy as Takira walks us through their modern-romantic, 3-locations engagement session! And Takira, you had us at "old, romantic feel"! "We got engaged in Paris, France and wanted that authentic feel. Of course flying to Paris and back for a photo shoot is not ideal on a wedding budget! However, the Italian brick buildings, romantic string lit gardens, and smell of party in the air was the perfect setting!" "Sidney and I wanted a smaller magnet, but did not want to lose the quality of our pictures. We chose not to have many colors or fancy fonts and embellishments on our announcements. This design allowed us to have more than one picture--all while keeping the size in mind. The simplicity in design allowed our love to shine without too many distractions." 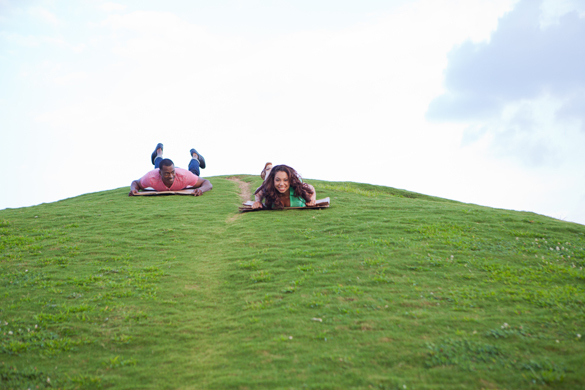 "The second location was a grass hill that is very popular in Chattanooga. Sidney took me to “ride the hill” as one of our first dates. His plan of sweeping me off my feet on a college budget worked! He brought the cardboard boxes to enjoy trips up and down the grass hill, and a picnic basket for lunch on the river afterwards! Such a sweet heart!" "Our last location was more relaxed. It was shot on the lake as the sun was setting." Kudos for the Wedding Pros! "Daisy is absolutely amazing! She took time to really get to know Sidney and I before our photo shoot even began! 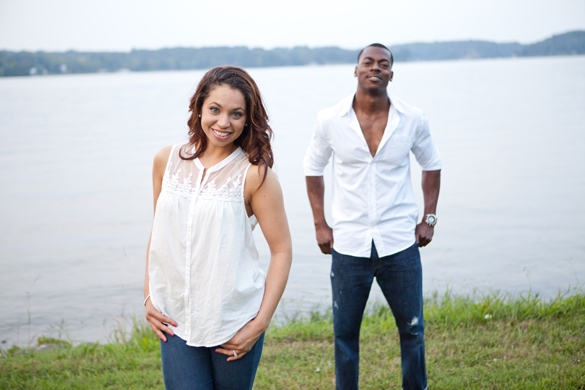 She and her husband did everything they could to make sure we enjoyed every minute of our shoot. She loves to catch the moments of love and life, instead of relying on poses to make the picture “look” good. Her magic happens naturally! 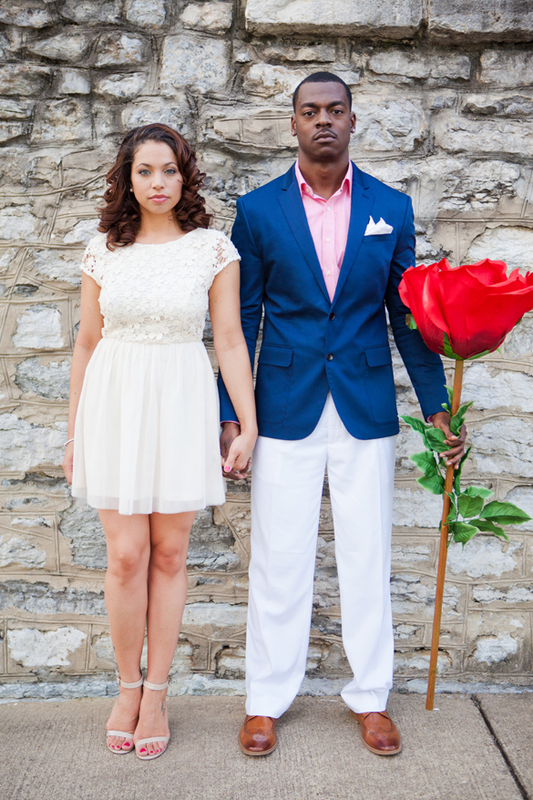 Sidney and I had so many ideas on what we wanted out of our engagement shoot. She was such a “trooper” when it came to visiting three locations to get everything we wanted…and more! I would quickly refer Daisy to anyone who is looking for a photographer! Sidney and I look forward to doing so much more with Daisy! Not to mention the adorable gift bag I received when our pictures were ready! We can never thank her enough!" "My fiancé and I were looking for a website that would allow us to customize our Save-The-Dates. He was stuck on our announcements being on a magnet, and I wanted our picture to express our love for one another. MagnetStreet gave us both with ease! We loved how easy it was to customize so many parts of the magnet! And the proof sample was amazingly accurate to what we received in the mail! During the ordering process, I had a few questions. And to my surprise, I received an email from someone who was personally handling my order! I didn’t receive an automated email with a 1-800 to call. I was VERY impressed! 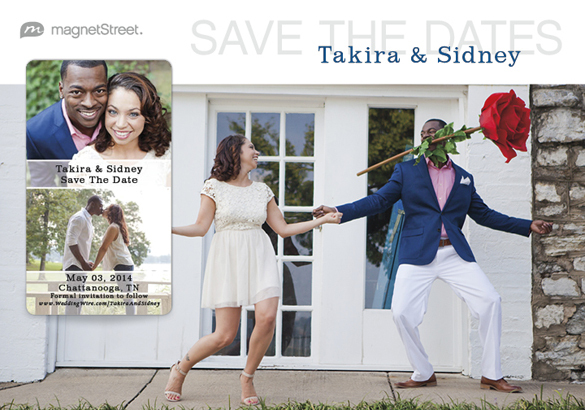 Thank you MagnetStreet for the amazing site and save-the-date." Submitted 5 years 2 months ago by Heidi.